Imagine a classroom. I am an English teacher and the students are in their seats, waiting for the lesson to begin. Today I intend to teach the meaning of the word awesome. I begin the lesson with some casual banter. This is a very BAD example of teaching. It’s terrible, in fact! I firmly believe we “worship leaders” and musicians are doing the same terrible teaching with the way we misuse the word worship: worship service, worship song, worship leader, worship center, worship band, worship experience, worship pastor, worship… musician. 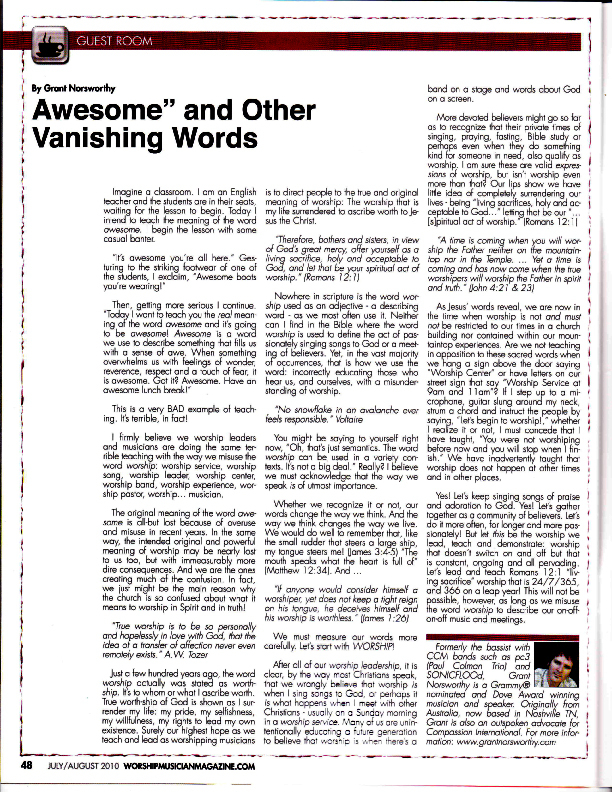 The original meaning of the word awesome is all-but lost because of overuse and misuse in recent years. In the same way, the intended original and powerful meaning of worship may be nearly lost to us too, but with immeasurably more dire consequences. And we are the ones creating much of the confusion. In fact, we just might be the main reason why the church is so confused about what it means to worship in Spirit and in truth! Just a few hundred years ago, the word worship actually was stated as worth-ship. It means to ascribe worth to something or someone. True worth-ship of God is shown as I surrender my life: my pride, my selfishness, my willfulness, my rights to lead my own existence. Surely our highest hope as we teach and lead as worshiping musicians is to direct people to the true and original meaning of worship: The worship that is my life surrendered to ascribe worth to Jesus the Christ. Nowhere in scripture is the word worship used as an adjective – a describing word – as we most often use it. Neither can I find in the Bible where the word worship is used to define the act of passionately singing songs to God or a meeting of believers. Yet, in the vast majority of occurrences, that is how we use the word: incorrectly educating those who hear us, and ourselves, with a misunderstanding of worship. You might be saying to yourself right now, “Oh, that’s just semantics. The word worship can be used in a variety contexts. It’s not a big deal.” Really? I believe we must acknowledge that the way we speak is of utmost importance. We must measure our words more carefully. Let’s start with WORSHIP! After all of our “worship leadership”, it is clear, by the way most Christians speak, that we wrongly believe that worship is when I sing songs to God, or perhaps it is what happens when I meet with other Christians – usually on a Sunday morning in a “worship service”. Many of us are unintentionally educating a future generation to believe that worship is when there’s a band on a stage and words about God on a screen. As Jesus’ words reveal, we are now in the time when worship is not and must not be restricted to our times in a church building nor contained within our mountaintop experiences. Are we not teaching in opposition to these sacred words when we hang a sign above the door saying “Worship Center” or have letters on our street sign that say “Worship Service at 9am and 11am”? If I step up to a microphone, guitar slung around my neck, strum a chord and instruct the people by saying, “Let’s begin to worship!,” whether I realize it or not, I must concede that I have taught, “You were not worshiping before now and you will stop when I finish.” We have inadvertently taught that worship does not happen at other times and in other places. Yes! Let’s keep singing songs of praise and adoration to God. Yes! Let’s gather together as a community of believers. Let’s do it more often, for longer and more passionately! But let this be the worship we lead, teach and demonstrate: worship that doesn’t switch on and off but that is constant, ongoing and all pervading. Let’s lead and teach Romans 12:1 “living sacrifice” worship that is 24/7/365, and 366 on a leap year! This will not be possible, however, as long as we misuse the word “worship” to describe our on-off-on-off music and meetings. Blessings in Christ to you my friend! Great post, thank you. I found you via Steve’s post @ Emergence. Thank you for a very honest and scripturally informed post. Let us continue to press on to worship the Worthy One with every bit of our lives – all our heart, soul, strength and mind.